It's roughly the size of a rugby ball, but with retractable landing and propeller struts. Normally, when you think "quadcopter", you think of the standard block-shaped mass of propellers, struts and landing gear. But nothing says they have to look that way. In fact, one drone company from China is taking a radically different approach with a UAV that looks like something from the labs of Capsule Corp. The Power Egg is the latest autonomous flyer from Beijing-based Power Vision and marks the company's first foray into consumer UAVs. The Egg weighs 4.6 pounds and is roughly the size of a rugby ball. Its body is comprised of high density plastic. Despite its namesake, this device appears surprisingly sturdy. Both its landing gear and propeller struts retract back into the housing for easy transportation but flick out for flight. Well, technically the landing gear automatically extends -- you'll have to manually lock the propeller struts in place. The bottom tip of the Egg pops off to reveal a 4K UHD camera mounted on a stabilized 360 degree gimbal. Conversely, the top tip houses the drone's 6,400mAh battery. The Power Egg is capable of flying both indoors and out. When outside, the UAV's onboard GPS keeps track of where it is relative to the operator. When flying inside, the Power Egg switches over to sonar and ground pattern recognition to understand its orientation. But the Power Egg's shape isn't its only unique feature. 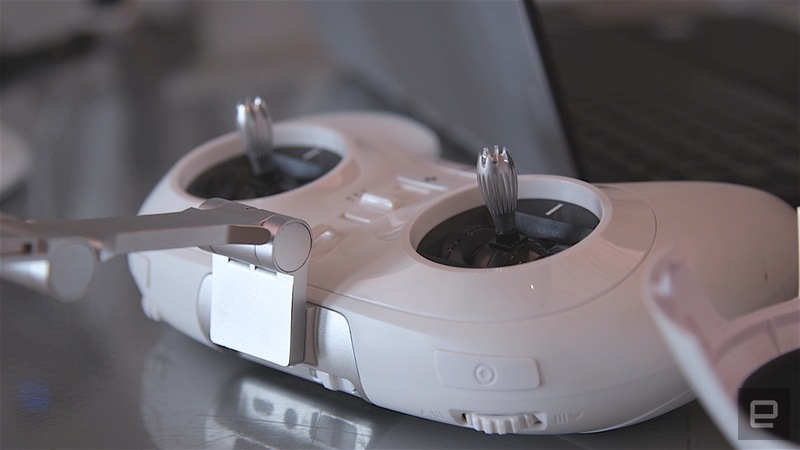 Users can control the UAV with either a standard two-axis controller or with a Nintendo Wii-like gesture remote. This secondary controller is designed specifically for people who are new to flying and may be hesitant to give it a go. Therefore, PowerVision made it super simple to use. Wave the remote up to have the Power Egg climb or sweep to the left and right to have it pan. Users will have to hold an activation trigger when gesturing, just to ensure they actually mean to move the Egg and aren't just waving their hands around. And if that's too much for your tech-phobic relatives to handle, the wand remote also includes an analog thumbstick. Both remotes offer single-button landing and both rely on your iOS and Android mobile device for processing power. Interestingly, Power Vision offloaded the 2.4 GHz antenna that are normally affixed to the back of the remote and made it into a standalone "base station". That is, your mobile device will still communicate to the Egg through this station, but it won't be attached to the controller itself. That allows for both remote control options without having to cram unwieldy antennas onto each one. Even with the base station setup, the Power Egg boasts an impressive maximum communications range of 5 km -- assuming you can get it that far with the drone's 23 minute battery life and 13 m/s maximum airspeed. The Power Egg is also able to think for itself, to a degree, and offers a number of autonomous features. You can command it to travel between pre-selected waypoints while you control the camera, have it circle a specific location -- you can even have it perpetually train its camera on the operator in Selfie Mode. 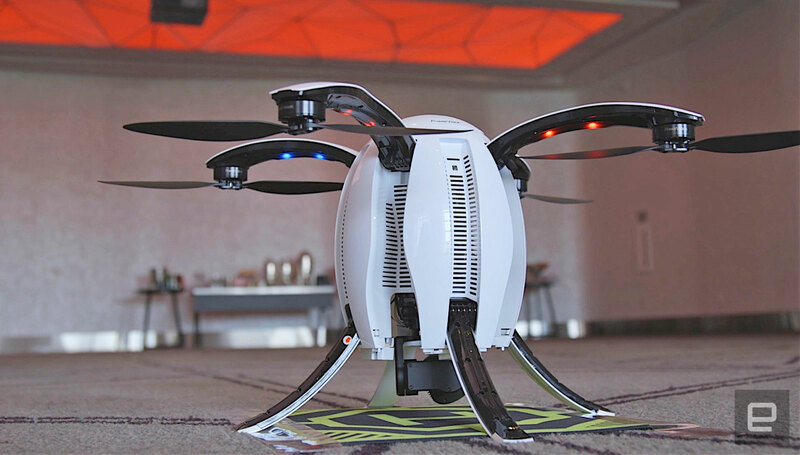 Despite the robust specs, the Power Egg is geared more towards casual users than the "prosumers" who'd otherwise be looking at high-end drones, such as the DJI Phantom 4. Company reps told me at a recent demonstration that, while there will likely be some overlap with some professional services like Real Estate marketing, they expect the Power Egg to be used primarily for snapping pictures and video of yourself and your loved ones. And, while conventional quadcopters are typically stored out of sight when they're not in use, the Power Egg has been designed to take center stage on your living room coffee table as a piece of functional modern art with an included storage stand. The Power Egg is currently available on preorder from the PowerVision website. For $1,288/£1,290 you'll get the Egg itself, both controllers, the 2.4 GHz base station, the battery, necessary charging cables and a stylish backpack in which to carry them all. The company expects the first models to ship 8-10 weeks after preorder ends, so you're looking at mid-October for deliveries to start.